Clicking one of these buttons will activate a kind of vertical toolbar that contains a window, where they are lot of information. These vertical bars are called “Palettes”. 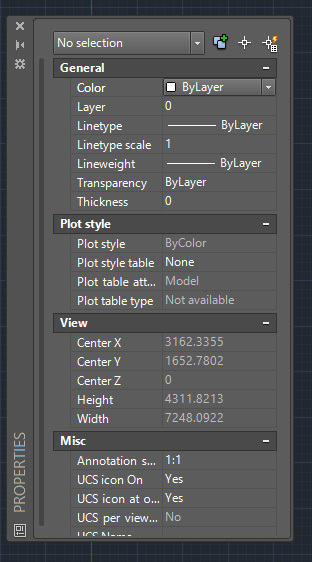 They are part of the “Palettes” even the Ribbon and Layer manager window. This window can be moved to either side of the screen, and clicking on the arrow on the board (under the X item), open and close the side window with information about objects. If we select an object and then we go on this window, we will show a whole range of information, which are in fact the “properties” of the object that we have selected. As you see, above are the entries for the color, layer, and linetype. Clicking on the value of these items, can also be change here in the same way that we had already seen in the previous chapter. The fourth item are “Linetype scale”, where we can put a numerical scale factor for the type of line used. The scale value entered here, however, is relative to each selected object and is independent of the value set in the variable "LTSCALE", or rather acts in addition to this. 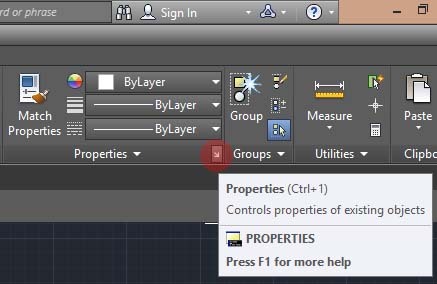 To close the Properties window, just click again on the command or the X at the top of the proprties palette.